I’m sure by now our astute readers have cottoned on to the fact that our time in China was filled with plenty of ups and downs. Truth be told, it probably featured a lot more downs than ups. And no one is more disappointed about this than we are. Seriously. I never sat down and tried to transform my dreams of what our time in China would be like into words, but it’s fairly accurate to say that they were about as large as the country itself. For all the time I spent fantasizing about what we would see and experience while there, I never once considered that rather than living up to my lofty dreams, China might instead turn out to be the stuff of nightmares. Sure I had read of others who had visited China and left disenfranchised, but I never thought for one second we would be amongst them. We’ve told you about our various triumphs and also of our disappointments during our first 1.5 weeks in China. There were enough of each that while we couldn’t exactly say that we liked the country very much, we also couldn’t completely write it off either. Sure we had struggled, but didn’t payoffs like visiting the Great Wall or seeing the caves of Datong make up for it? Perhaps. But there was a larger issue that was weighing us down, preventing us from truly enjoying ourselves in China; we had come to terms with the fact that some of the artifacts would underwhelm, that aspects of the culture would make us uncomfortable, but the one thing that made us unbearably depressed was the less-than-glowing impression we had formed about the people. We’ve said it before, but for us, the people are the places, and for the most part, the people we had encountered in China had not been very nice at all. Yes, we had weathered a lot of scams (some more successfully than others) and ruthless price gouging, and while these may have been mentally exhausting, we were prepared for them to some extent and didn’t take them personally. What we weren’t ready for was the blatantly rude behavior we experienced, and I’m not talking about people taking surreptitious pictures of us or staring at us unabashedly (though those things did happen). That stuff might be weird, but is nothing in comparison to being repeatedly lied to about things, or having people laugh in our faces when we tried to speak Chinese to them or simply pretend they could not understand us, even when we showed them the characters in our phrase book. It got to a point where, quite honestly, we were hardening our hearts against the people around us, bracing ourselves whenever we had to deal with the locals, and generally not trusting or liking anyone other than each other. It wasn’t a nice place to be. 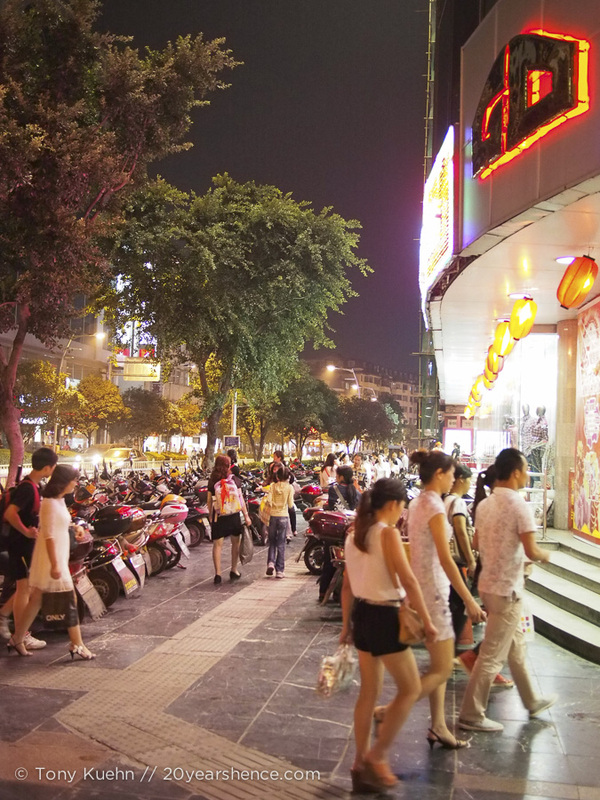 The hustle and bustle of Guilin at night. They can’t all be bad people, can they? 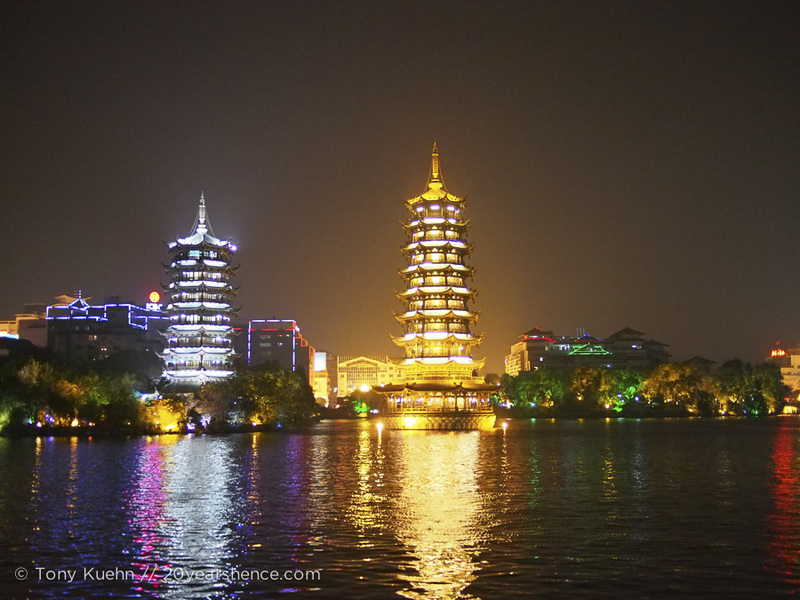 When we landed in Guilin, we were cautiously optimistic about the state of Chinese urban environments having liked Xi’an quite a lot, and though we soon found ourselves enjoying how colorful the city was, we remained extremely wary about the people we would meet there. Checking into our hostel, the girls at the front desk greeted us with ready smiles and apologized effusively (in unimpeachable English, no less) when they had to inform us that our room wasn’t ready as we had arrived 30 minutes early and they needed to finish cleaning it. But would we mind relaxing in the lounge while they gave us some information about Guilin and some of the nearby sights? Our warm welcome seemed promising, but we still weren’t convinced. When we headed off to the train station to buy some tickets for daytrips, we girded our loins, preparing to do battle with the world. After waiting in a dreadfully long line only to be told that the tickets were all sold out (although they had ostensibly only gone on sale that very day), we hung our heads in defeat and began to head back to the safe haven of our hostel. As we wended past various tour agent booths scattered outside the station, an older man approached us and asked if we needed help. We looked at him warily and told him we were fine, we had just been trying to buy tickets for a daytrip we were planning to take from our next destination, Shanghai. He told us that the tickets we wanted would absolutely be available and that perhaps the ticket agent simply had not understood us… but he could act as our translator! Having just been maybe tea scammed, we were obviously suspicious of this man’s motives, as there was no logical reason why anyone would choose to brave the terror that is train station ticket lines on someone else’s behalf. Nevertheless, we agreed to go along with it, figuring that if he was able to get tickets for us, he’d likely ask us for some kind of payment… As we waited in line, our companion was all lightness and kindness, telling us we had the right idea to get out of the area for the upcoming Golden Week festivities as prices skyrocketed to unconscionable levels and commending the excellent price we got on air fare. We soon found ourselves talking and laughing easily with him, hardly concerned with the claustrophobic crush of humanity that writhed about us. When we reached the counter, the ticket agent gave our companion a very sour expression and said something sharply to him in Chinese. We have no idea what was said, but after about 5 minutes of back-and-forth between the two, he turned to us apologetically and said that the agent was telling him the same thing about the tickets, but that we should try getting bus tickets to our destination when we reached Shanghai as they would surely be available. And then, although he had spent nearly an hour of his time on this fruitless quest for strangers, he simply shook our hands, gave us bright smile, and wished us the best of luck before heading on his way without ever asking anything of us. Now, perhaps this guy was running some kind of scam or maybe if he had been able to get us the tickets we wanted he would have asked for some kind of commission. All sorts of sinister motivations can be ascribed to him, but as we walked back to our hostel, bouncing all the possibilities off of one another, we started to question why we were bothering to do so. The sad truth was that while in Japan, many strangers had gone out of their ways to help us along and we never once gave it a second thought or looked for a hidden catch. We merely felt buoyed by these random acts of kindness, and looked on them as confirmation that ultimately, the world is filled with good people. Had China so thoroughly jaded us that we could no longer believe this to be true? If this were the case, then it was exactly the opposite of what I had hoped to learn while traveling. Embers of shame began to glow at our cheeks as we acknowledged the ugliness we had been fomenting inside of us. We realized that we had amplified the negative run-ins and discredited or misinterpreted the positive ones since arriving in China… sure we had met a few jerks, but our own outlook hadn’t helped matters either. If we were being completely honest with ourselves, ever since stepping off the train in Beijing, we had been wandering around completely on guard, worried beyond reason about scammers lurking around every corner. We had fallen into the trap of deciding people in China were generally awful and were merely looking for proof to confirm that notion. Turns out that if you go around fearing the worst about people, you may just find yourself in a self-fulfilling prophecy as you poison your mind against everyone. Putting your trust in strangers makes you feel incredibly vulnerable, but we knew that by doing so, we would not only be allowing ourselves to be tricked, but also to be swept away on a tide of kindness and generosity. As the old saying goes, nothing ventured, nothing gained. While he was talking about helping us buy train tickets our get around town, the shop owner helped us in ways he likely never intended. Along with the other friendly people we met in Guilin, he helped us see the error of our ways: just as Xi’an taught us not to paint all Chinese cities with the same brush, Guilin taught us that in a country with over 1.5 billion citizens, there may be an awful lot of rotten apples, and unfortunately, sometimes we’re part of them. Great post, I know just how you feel! I felt the same about Vietnam, but unfortunately no one redeemed Vietnam for me. I just keep telling myself it isn’t possible for a whole country of people to be terrible and out to get me… I should probably give Vietnam another try someday. We have heard so many mixed things about Vietnam so I can’t say I’m surprised to hear you had a rough go of it there. We were originally planning to hit up Vietnam immediately following China, but given the bumpy time we had in China, we decided we probably needed to get some other countries under our belt before hitting up Vietnam! I am really happy to hear that you felt more appreciated in your current destination than you did in China. It sounds like the Chinese you met were rude and supercilious, and it would have made me angry and baffled as well. I don’t think Americans are like this. I don’t think we see tourists and just opt to treat them badly. But it seems that some of the Chinese were this way to you. I am glad that your myths were dispelled, and that you finally found some kindness. It sounds like it was a long time coming! I know a lot of people subscribe to the stereotype that Americans are rude and mean, but traveling broadly really opens your eyes to your own backyard. While I would say that Americans are not the friendliest people on the planet (seriously, some of the hospitality and kindness we have experienced in Asia is not to be believed), I think you guys are a lot more welcoming than you are given credit for! Anyone who thinks the U.S. is rough should travel to China and then get back to me! Ummmm…nearly shed a tear at the “I CAN HELP YOU” sign story! Seriously! I’m glad you guys have had some redeeming adventures there. I have a somewhat negative stereotype of traveling in China in my head, and you’re right – that kind of mindset can lead you into situations with the worst thoughts. Rika | Cubicle Throwdown recently posted..Million dollar toilet paper folding. Yeah, I got teary typing that part up myself! It just goes to show that you should never cast aspersions on an entire country or place, because there are good people everywhere, if only we are willing to look for them! Wow, such a great post. It can be hard to reframe your perspective, but I love that you were able to. What a rough intro to China you had, though. I can certainly understand why you’d be suspicious. I think that when things are going bad, it’s important to take a step back and try to consider how we might be contributing to the situation. Sometimes it’s just bad luck, but bad luck doesn’t generally last for weeks on end! Still, bad stuff is going to happen, it’s what we do when it does that really counts. While I certainly believe that China can be extremely difficult, by acknowledging that we were part of the problem, I at least feel like from this point onward, we did everything in our power to salvage our time there! It’s wonderful that you’re willing to admit when you’re in the wrong and allow yourselves to see a different perspective. I don’t think a lot of people would be willing to admit that and try again. That’s a great story and I’m glad your time in China turned around for the better! I think the only way we grow is sometimes by taking a hard look at ourselves and accepting that there are things we are doing poorly that we can improve upon. None of us are perfect, not even those of us who go and travel the world, and it’s important to never lose sight of that! I read this great quote the other day by Henry Ford: “Failure is just another chance to start again more intelligently.” I couldn’t put it any better myself! What a great experience to counter that last one! Yup! That’s life on (and off…) the road for you. You’ve got to take the bad with the good! It’s a good thing that the last encounter helped you see the country and its people on a more positive… a man I met on the bus in Mexico took out a picture of his “family” and try to make conversation with me. At the end of the journey, he offered to give me a ride to wherever I was going. I turned it down because my gut tell me that I would end up somewhere bad. Despite this bad incident, I still think that Mexico and its people are one of the nicest people I have ever met. They did not cheat me once during my month there. I definitely think that one needs to be more cautious when traveling alone! It can be hard to strike a balance between being open & friendly and staying comfortable, but in the end, if you go with your gut, you’ll probably never regret your choices! I moved from a touristy southern town, not small, because of the military, but certainly not a “city” by any stretch of the imagination, to NYC. You hear a lot of stereotypes about New Yorkers when you live in the south, and, frankly, sometimes they’re true. The thing is, after living here for a year and a half, sometimes they’re true about me. I try to smile openly to people who approach me, especially if I can tell they’re tourists, but I’ve also been cat called and scammed *so* many times in the city, that some days I just don’t have the energy to smile. There are days when you are just run down by the sheer enormity of the place you live in, the effort it takes to just walk through a crowd. Being surrounded by that many people is, honestly, exhausting. And exhilarating at times! But, honestly, mostly exhausting. There have been days when I have scowled at strangers who have done nothing to me, when I have angrily pushed past tourists in my rush to get home (I have an hour long subway commute), when I have sighed loudly as I waited for people unfamiliar with the subway system to figure it out. There are so many times when I should choose patience and kindness, when instead I choose frustration and anger. I’m not defending the bad behavior you experienced, but I do understand it and I’ve certainly been guilty of it. Not the scamming or openly laughing at people, but certainly a general rudeness. And as crowded and overwhelming as New York is, I know that China is even more so. I love how honest this post is. I love that you took a look at your own generalizations and see how that’s impacting the way you see an entire people and experience. I don’t think you can find the goodness in people if you don’t open yourself up to it, like you did in the bakery. I’m glad you found warmth and kindness in China after all. I feel like that last paragraph sounds like I’m saying the reason people were rude to you was because you weren’t open to their kindness, but that’s not what I’m saying at all! Only that once you’ve become hardened to it, it’s hard to open up and not think people are scamming you. Your China story keeps getting better! I like the twist in this story, China/Chinese people can’t all be bad. We’re even thinking about going back there! China definitely was a roller coaster for us! And even though we had plenty of downs (oh, there are more to come! ), it’s a place I think I’d like to revisit when we’ve had some more travel experience under our belt. It’s just so huge that I think it’s hard to get an accurate bead on it in just one visit! I’m glad your time in China somewhat redeemed itself. We loved China, but I won’t pretend our month there was always easy (or ever easy?!). We were so grateful for the patience, kindness and generosity of most people we encountered – and tried not to let the a-holes undo that. I still maintain that no one on this planet is better at getting your money out of you than a Chinese market vendor/taxi driver/water seller though! If we had met more people like we did in Guilin, I think our time in China would have been dramatically different. If we ever return (and I actually hope we will! ), I think we’d make a much more concerted effort to make local contacts in the places we visit. When you’re in a place where nothing makes sense, having someone there who you know is looking out for you can make all the difference! I’m so glad you had some redeeming moments in China, and you write about it so well. But you’ll definitely have to go back one day and bring me with you as a guide! We certainly had a rough time in China, there’s no denying that, but we did have enough truly excellent moments that I could never write off the country as a whole. I know it baffles Tony, but I do really want to give China a second chance, and I hope that when we do we will have you as our fixer! 😉 XLBs are on us! If you travel in China, don’t waste time in any big Cities. All the beauties are far from the big cities. You should follow the backpackers, not the tour guide. For example, one want to visit the Greatwall in Beijing, don’t go to Badaling section of the Great Wall. The best choice is the XIZHAZI village (http://goo.gl/maps/pOIZm), go to there and you can find the real Greatwall (http://news.xinhuanet.com/travel/2007-04/24/content_6018728.htm). Hi Michael—Yes, we would agree that for the most part the cities in China are not the best places in the country, especially if you are a relatively new traveler as we were when we visited. There were a few cities that we did like, and actually, Guilin was one of them, the other being Xi’an. Shanghai was also ok, but nothing special in our opinion. We definitely regret that we didn’t get to visit more of the countryside during our time there. Happily, we did not visit the Badaling section of the Great Wall, but rather Mutianyu. Still a bit touristy but hardly any crowds!